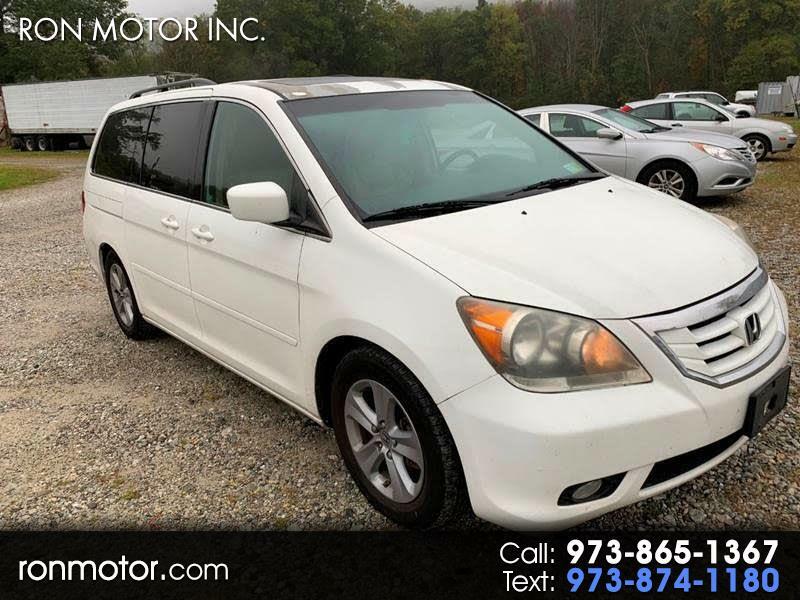 Used 2009 Honda Odyssey Touring for Sale in Wantage NJ 07461 Ron Motor Inc.
Additional InformationRear Spoiler - Roofline,? Body Side Moldings - Body-Color,? Front Bumper Color - Body-Color,? Mirror Color - Body-Color,? Rear Bumper Color - Body-Color,? Rear Spoiler Color - Body-Color,? Steering Ratio - 16.2,? Turns Lock-To-Lock - 3.40,? Floor Mats - Front,? Floor Mats - Rear,? Front Air Conditioning - Automatic Climate Control,? Front Air Conditioning Zones - Dual,? Rear Air Conditioning - Automatic Climate Control,? Rear Air Conditioning Zones - Single,? Shift Knob Trim - Leather,? Steering Wheel Trim - Leather,? Adjustable Pedals - Power,? Cargo Area Light,? Conversation Mirror,? Cruise Control,? Cupholders - Front,? Cupholders - Rear,? Cupholders - Third Row,? Dimming Rearview Mirror - Auto,? Memorized Settings - 2 Driver,? Memorized Settings - Driver Seat,? Memorized Settings - Side Mirrors,? Multi-Function Remote - Keyless Entry,? One-Touch Windows - 1,? Power Outlet(S) - 115v Rear,? Power Outlet(S) - 12v Front,? Power Outlet(S) - 12v Rear,? Power Steering - Variable/Speed-Proportional,? Reading Lights - Front,? Reading Lights - Rear,? Reading Lights - Third Row,? Steering Wheel - Tilt And Telescopic,? Steering Wheel Mounted Controls - Audio,? Steering Wheel Mounted Controls - Cruise Control,? Steering Wheel Mounted Controls - Phone,? Storage - Cargo Tie-Down Anchors And Hooks,? Storage - Front Seatback,? Storage - Grocery Bag Holder,? Storage - In Floor,? Storage - Rear Seatback,? Storage - Sunglasses Holder,? Sunshade - Side Window,? Universal Remote Transmitter - Homelink - Garage Door Opener,? Front Brake Type - Ventilated Disc,? Front Shock Type - Gas,? Front Spring Type - Coil,? Front Struts - Macpherson,? Front Suspension Type - Lower Control Arms,? Rear Brake Type - Disc,? Rear Shock Type - Gas,? Rear Spring Type - Coil,? Axle Ratio - 4.31,? Electronic Brakeforce Distribution,? Front Brake Diameter - 11.7,? Front Stabilizer Bar - Diameter 23 Mm,? Front Suspension Classification - Independent,? Rear Brake Diameter - 12.3,? Rear Suspension Classification - Independent,? Stability Control,? Traction Control,? Cylinder Deactivation,? In-Dash Cd - Mp3 Playback,? Navigation System - Voice Operated,? Satellite Radio - Siriusxm Ready,? Total Speakers - 6,? Video System - Dvd Player,? Warnings And Reminders - Maintenance Due,? Warnings And Reminders - Tire Fill Alert,? Wireless Data Link - Bluetooth,? Antenna Type - Element,? Auxiliary Audio Input - Jack,? Headphones - Wireless,? In-Dash Cd - 6 Disc,? Multi-Functional Information Center,? Phone - Hands Free,? Radio - Am/Fm,? Remote Control - Video,? Subwoofer - 1,? Video Monitor Location - Rear,? Video Monitor Size - 9,? Warnings And Reminders - Lamp Failure,? Low Fuel,? Engine Oil,? Coolant,? Watts - 360,? Daytime Running Lights,? Front Fog Lights,? Headlights - Auto Delay Off,? Headlights - Auto On/Off,? Headlights - Halogen,? Rear Door Type - Power Liftgate,? Side Door Type - Dual Power Sliding,? Tire Type - All Season,? Tire Pressure Monitoring System,? Wheel Spokes - 5,? Window Defogger - Rear,? Front Wipers - Variable Intermittent,? Rear Privacy Glass,? Rear Wiper - Intermittent,? Rear Wiper - With Washer,? Active Head Restraints - Dual Front,? Airbag Deactivation - Occupant Sensing Passenger,? Anti-Theft System - Theft-Deterrent System,? Camera System - Rearview,? Child Safety Door Locks,? Child Seat Anchors - Latch System,? Front Airbags - Dual,? Impact Absorbing Bumpers,? Parking Sensors - Front,? Parking Sensors - Rear,? Power Door Locks,? Rearview Monitor,? Rolling Code Security - Key,? Side Airbags - Front,? Side Curtain Airbags - Front,? Side Mirror Adjustments - Power,? Side Mirrors - Heated,? Side-Curtain Airbag Rollover Sensor,? Driver Seat - Heated,? Driver Seat Manual Adjustments - Lumbar,? Driver Seat Power Adjustments - 8,? Front Headrests - 2,? Front Headrests - Adjustable,? Front Seat Type - Captains Chairs,? Passenger Seat - Heated,? Passenger Seat Power Adjustments - 4,? Rear Headrests - 3,? Rear Headrests - Adjustable,? Rear Seat Type - Folding Removable Center Seat,? Rear Seat Type - Removable Captains Chairs,? Rear Seatbelts - Center 3-Point,? Seatbelt Pretensioners - Front,?